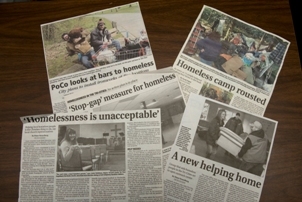 Since the creation of the Task Groups’ current strategy and action plan in 2007, there has been considerable change in the landscape of homelessness in the Tri-Cities. Over the course of the last 3 years, there has been a dramatic reduction in the number of persons homeless in the Tri-Cities – from an estimate by outreach workers of in excess of 200 persons to currently less than 50. At the same time, we have completed a number of the actions set out in 2007 and subsequent years, including successfully advocating for a permanent emergency shelter and transitional housing facility for the Tri-Cities. The Task Group has engaged Ethos Strategy Group to facilitate a strategic renewal process for the Task Group. To provide input to the planning sessions, Ethos has compiled a stakeholder survey. Your responses to the survey questions would assist us greatly to set the Task Group’s course and future actions. To complete the survey, click here.